It will be interesting to see how the global warming Nazis continue to spin the barrage of data against their cause. It makes me wonder how this can continue with the evidence just piling up against this movement. As reported several weeks ago, over 31,000 scientists across the U.S.–including 9,000 Ph.D.s in fields such as atmospheric science, climatology, Earth science, environment and dozens of other specialties, have signed a petition that rejects the basic tenants of “global warming”. The so-called “scientific consensus” supporting global warming does not exist and now even more data is available that debunks this wide spread unfounded notion. 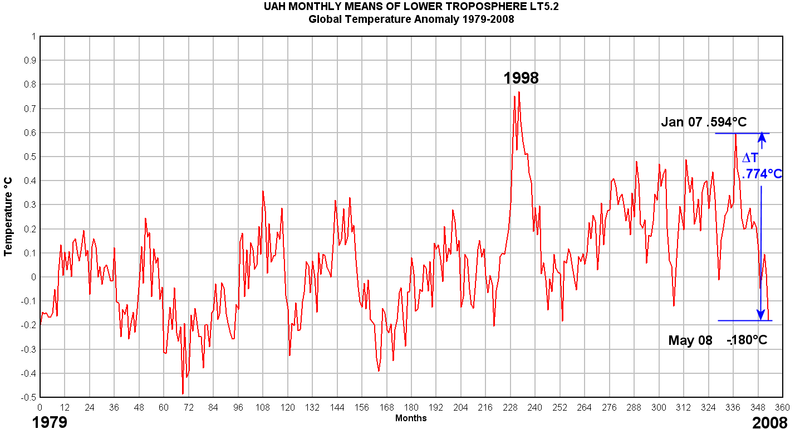 But the latest news is that global temperatures continued to fall and did so significantly in May 2008. Compared to the May 2007 value of 0.199°C we find a 12 month ∆T is -.379°C. But even more impressive is the change since the last big peak in global temperature in January 2007 at 0.594°C, giving a 16 month ∆T of -0.774°C which is equal in magnitude to the generally agreed upon “global warming signal” of the last 100 years. So, in other words, ever since this man-made global warming notion was sold to the general public, global temperatures have actually plateaued and even fallen slightly. Carbon emissions have continued to rise, yet there is almost no response in the temperature graph despite this rise. No one is debating that the last number of years have been hot, but the cause is what is debatable. It’s funny that the environmentalists ignore the fact that the temperature of several of the planets in our own galaxy have risen to a similar degree. Man-made global warming is not based on fact. It is an ideology that is rooted in destroying the “western” way of life. It seeks to place us as the cause of all the problems in the world. The way we assuage our guilt is becoming poorer–we drive less, we use less, we eat less. There are even new “green” websites that will tell you when you should die, so that you don’t use up too much of the earth’s resources. The goal of the man made global warming movement is to beholden us to environmentalism and their political views–not to actually save the planet. Besides, from much of the recent data, it looks like we don’t need saving from much of anything–other than perhaps global idiocy.